Woman sorting papers in the Cooper Glicerio cooperative, Sao Paulo. Moving slowly like a shadow, dressed in rags, a man was painfully dragging behind him a huge cart overflowing with boxes, on the main business street of Sao Paulo, Avenue Paulista, and nobody seemed to notice him anymore. I am in Brazil for one month to work on an inclusive waste management project and was not surprised to see so many waste-pickers, called catadores in Portuguese, in the street. 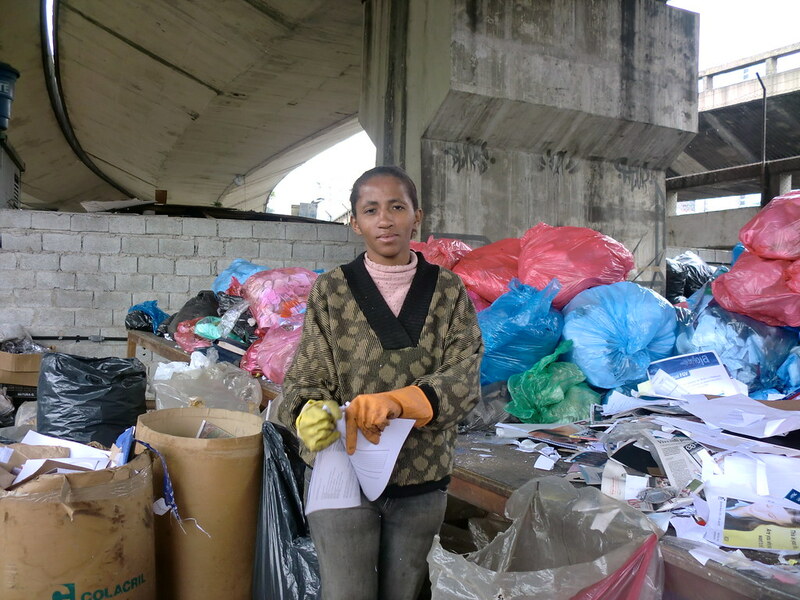 Informal recyclers are estimated to be 30,000 people in Sao Paulo. However, I was not prepared to see them among rich paulistas, picking up trash from luxury night clubs, restaurant or even fitness centers and a spa for dogs. My first impression is that informal waste management is a complex issue in Brazil. Some argue that working on an inclusive policy is not the only option and another system, without informal waste-pickers, should be promoted in the future. But is there any choice now? Catadores exist because there is an economic opportunity for them, but also because they do not have a better option to survive. They contribute to reducing public waste quantity and increasing recycling. 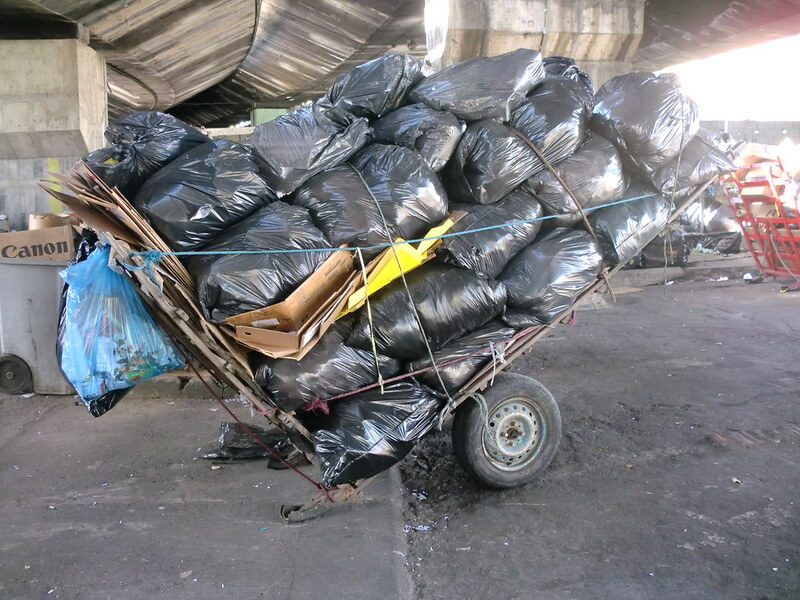 Only 1% of domestic waste is recycled through municipal collection system in Sao Paulo. Yet, the dialogue to include waste-pickers in waste management and recycling policy seems to be locked. Part of the problem might be in the shadows: invisible individuals or groups taking profit from the current system. Part of the solution might be projecting light: understanding, mapping the system to identify or create opportunities for change. At the dawn of the project, so many questions are arising: Are we dealing with recycling, social integration, city management or logistic issue? Is policy the best channel to create change in this particular case? Or could individual agents set an example of good practice, and thus create organic change, leading to institutional adaptation? After a week in Sao Paulo, I feel that so much energy, expertise and good will has been spent during the last twenty years trying to create a dialogue platform between different stakeholders with disappointing results. Therefore designing a project that would make a difference by creating concrete and sustainable results is such a challenge. Catadores cart in the Cooper Glicerio cooperative, Sao Paulo. Caroline Brun is from France. She is currently a student in the Technology and Policy Masters Program at MIT and works as a research assistant in the MIT Joint Program on the Science and Policy of Global Change on Renewable Energies policies. Interested in social entrepreneurship, she has been rewarded with the MIT Legatum Center 2010 fellowship. Egypt and India also have vast and efficient informal recycling systems, powered by very poor waste-pickers. Such countries would do well to tap into and enhance this productive system, while working to improve safety and incomes, instead of blindly implementing recycling programs and facilities to mimic the West.